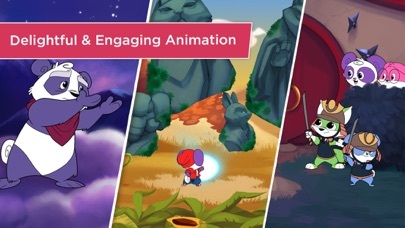 The first-ever original story series made exclusively for iPhone and iPad – it’s a magical and uniquely interactive form of storytelling designed for kids ages 4+ to encourage strong values and positive character. The stories include free play, games and exploration, turning iPhone and iPad time into a creative and educational experience. Users can choose to purchase the complete series of The Adventures of Pan as a single app or each book individually as 7 separate apps. Pan wakes up on a mysterious island while her friends prepare for battle with the enemy. Though her confidence is shaken after letting Din escape, she finds the strength to train with the Han Hopefuls - a long lost tribe of gifted fighters. Will she master her craft in time to help her friends? Hullabalu is a small company based in NYC, creating adventures and stories for the new generation. We are inspired by our love for magical worlds, the timeless classics we grew up with, and the kids who inspire us everyday.